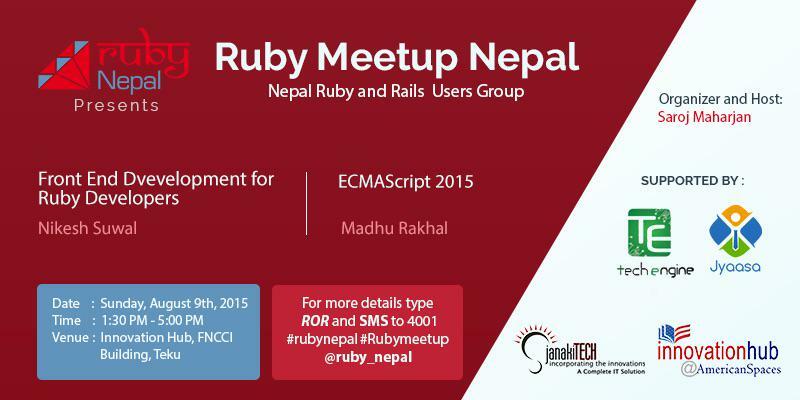 Every year around the world there are ruby meetup and rails meetup happenings, so why not organise Ruby/Rails Meetup here at Kathmandu. This meetup will not be just an event but also be a point of unite and interaction and sharing of knowledge and experiences between the distributed ruby developers in kathmandu valley. This will be a regular event happening once a month, to be specific; every second Sunday of the month starting August 9th, 2015. We want a lot of people and groups to be engaged to make this event success. Feel free to suggest us ideas and to come up forward. And if you want to present or be a speaker at the meetup, you are most welcome and this is your time to send us details. Thought about speaking? Want to give speaking at Ruby on Rails Meetup a shot, but not sure what to talk about? Even if you have a tiny inkling that you’d want to speak, like your experience, technology, tips and tricks, even maybe a tutorial, we’ll help you to ideate, write and present. Great business starts with unsurpassed people skills, it is a great oppurtunity for tech business houses to be promoted and find connections at the event. We welcome sponsorship of any kind financial, promotional, resources or even may be a service or server. See you at the next Ruby and Rails meetup!